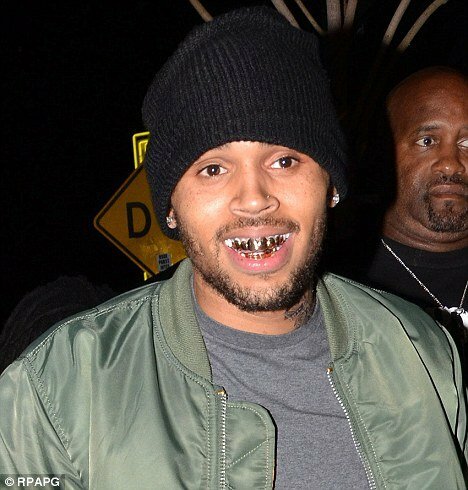 Last night, Chris Brown joined rappers Flavor Flav, Nelly, Lil Wayne, and Lil Jon in the trend by proudly flashing his golden chompers to the dancing crowds at AV Nightclub in Hollywood. Wearing a black beanie, Chris Brown, 23, was seen in an Army green bomber jacket over a grey shirt, low-slung dark denim jeans, and a pair of Air Yeezy sneakers designed by Kanye West. As if he couldn’t look more intimidating, surrounded by bodyguards, the multi-hyphenate star was also flaunting his bold new neck tattoo of a wolf. Chris Brown, whose new album Fortune was released today, reportedly partied at the Cahuenga hot-spot until close and then left without incident. Prior to the club, Breezy raised eyebrows after tweeting a photo of himself in the recording studio with none other than Victoria’s Secret model Chanel Iman, 21, calling her “beautiful”. It’s unclear why Chris Brown, whose girlfriend is Karrueche Tran and ex-girlfriend is pop star Rihanna, was hanging out with the five-foot-nine-inch stunner or what sort of beautiful music they might have been making together. His new album, featuring collaborations with Wiz Khalifa and Big Sean, topped the iTunes album chart yesterday. However, it’s already been getting not-so-hot reviews with critics labeling it, “boring”, “unremarkable”, and “edgeless”. Sunday night, Chris Brown was a big winner at the BET Awards where he took home Best Male R&B Artist and the Fandemonium Award after performing a medley of Don’t Wake Me Up and Turn Up The Music onstage in body paint. It’s all he can do to distract his fans from the recent bar brawl with rival Drake, which left eight injured, and his 2009 conviction for viciously assaulting his ex Rihanna after the Grammys.